Please Click on the Form below and then print a copy to mail. CARMA P.O. Box 814, Williamsburg, VA. 23187-0814.
a minimum of 1 week prior. 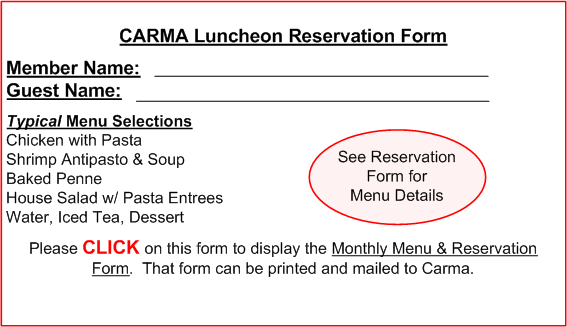 You must CLICK on the form to see the actual meal choices! Then you can print the form, fill it out, and send it in! SAMPLE MENU - CLICK ON IT & SEE THIS MONTH'S CHOICES !